Jack-Mormon: A nickname for a Mormon who is a member of the Church in name but not in behavior. Someone who is not valiant in keeping the faith. Jaredites: Jared and his associates were led by God from the destruction after the Tower of Babel to the Americas. Their society became wicked and ended in utter destruction. The record of the Jaredites is found in the Book of Ether in the Book of Mormon. Jehovah: Jesus Christ. “In the Lord Jehovah is everlasting strength….Thy dead men shall live, together with my dead body shall they arise” (Isaiah 26:3). Jesus Christ: The literal Son of God. By taking on our sins in Gethsemane and by His death on the cross, we are able to receive everlasting life and also eternal life, and be forgiven for our sins as we repent and align our lives with the teachings of God. Jesus created the world, lived in it, and atoned for the sins of its inhabitants, and so will also be our judge at the final Judgment. Mormons know Him as their Savior and the only source of their salvation. John the Baptist: The forerunner to Jesus Christ, sent to prepare the way before him. John administrated under the Law of Moses, performing the Aaronic Priesthood ordinance of baptism, even for Jesus Himself. He returned as a resurrected being to confer the Aaronic Priesthood upon Joseph Smith and Oliver Cowdery (Doctrine and Covenants 13). John evidently wrote scripture, but we have not yet been entrusted with it. Joint-heirs with Christ: Righteous men and women who make covenants with God can be adopted into His family and become heirs with Jesus Christ to all that the Father has. This includes the opportunity to know Him as He knows us, and to share in His knowledge, wisdom, truth, good attributes, and creative powers. Joseph Smith: The first prophet of the last dispensation of time before the Second Coming of Jesus Christ. Mormons do not worship Joseph Smith, but they revere him for the sacrifices he made and his willingness to face persecution and death to restore the gospel and priesthood authority to the earth for the benefit of mankind. Justification: Adam taught: “By the water ye keep the commandment; by the Spirit ye are justified, and by the blood ye are sanctified” (Moses 6:60). Justification makes just the actions of men and women who lay hold upon the atonement and live righteous lives. Justified acts and motives are accepted in heaven as they are on earth, because they are ratified by the Holy Ghost. Keys of the Priesthood: The term “key” is a symbol of power and authority. Keys represent the right to preside over a certain aspect of the Church. Jesus Christ holds all the keys and designates them for use by specific people. Only the president of the church can use the priesthood keys to carry out the work of the entire Church. Other keys are delegated to those who are authorized to use them for specific callings (church assignments), and are held only while the priesthood holder has the position. Keys are given only to presidents of temples, missions, stakes, and districts, bishops, branch presidents, and quorum presidents. Other leaders, such as counselors, receive authority through their calling, but not keys. Kingdom of God: The Church of Jesus Christ of Latter-day Saints is the kingdom which Daniel said would be established in the last days (Daniel 2:44-45). This same kingdom has been set up in past ages whenever the gospel has been on the earth. All the prophets have understood the Plan of Salvation, including that Christ would be the Messiah and perform the atonement. The Church was not established at Pentacost, but the kingdom of God was established with Adam, and it has existed whenever God’s power and authority and priesthood have been accepted by men. Laurel: The name of the class in the Young Women’s program for girls ages sixteen and seventeen. The girls are referred to as Laurels. Laying on of Hands: An ordinance performed by priesthood holders who place their hands on a person’s head. This may be done to bless a new baby, confirm someone a member of the church, offer a blessing of healing or comfort, or to give someone a new position in the church. Latter-day Saint: A member of The Church of Jesus Christ of Latter-day Saints. This is one of several informal names used for church members. 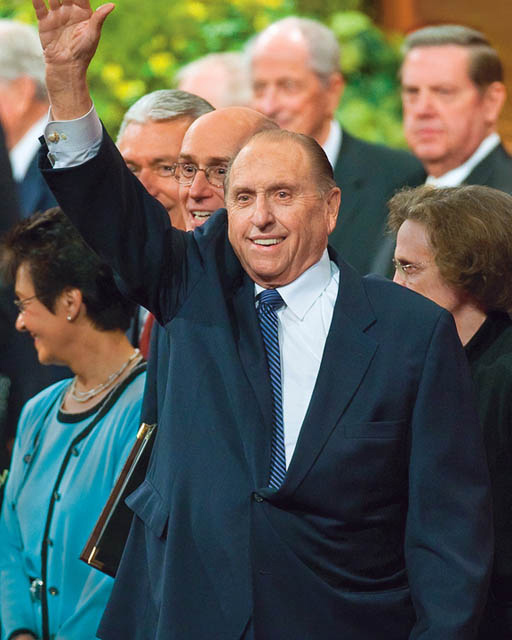 LDS: Abbreviation for Latter-day Saint. Also used as an abbreviated form of the official name of the Church: The Church of Jesus Christ of Latter-day Saints. Liahona: In the Book of Mormon, the Liahona was given by God to the prophet Lehi to help guide his family through the wilderness to the promised land. Nephi described it as “a round ball of curious workmanship; and it was of fine brass. And within the ball were two spindles; and the one pointed the way whither we should go into the wilderness” (1 Nephi 16:10). From time to time, written words appeared on the Liahona. It worked only when the family was righteous. “Liahona” is also the name of editions of the church’s official monthly magazine in all languages other than English. In English, the adult magazine is called The Ensign, with separate magazines for children and teenagers. Lost Scripture: Through information given by modern prophets, and from the Book of Mormon and Pearl of Great Price, we learn that there is much existing scripture that is currently lost to us. A portion of the Book of Mormon was withheld from Joseph Smith, because the world is not worthy to receive it. The Lord has indicated that we don’t yet have the full account of the events of the Mt. of Transfiguration (Doctrine and Covenants 63:21). The Book of Mormon cites the prophets Zenock and Zenos, Neum, and Ezias, unknown to us. We have not yet received the writings of Joseph who was sold into Egypt (2 Nephi 3), or of John the Baptist. The Ten Lost Tribes will return with scriptures of their own make. Adam kept a Book of Remembrance, and Enoch also wrote. The New Testament is replete with references to unknown scriptures. Lost Tribes: The people of the ancient northern kingdom of Israel were conquered by the Assyrians and forced to participate in a great population transfer. Some assimilated and later spread over Europe and elsewhere. (A large number of Latter-day Saints are descended from Ephraim.) A group of repentant Israelites were separated, led away, and hidden by the Lord (Apocrypha, 2 Esdras 40-47). They will return as a group in a miraculous way, bringing their prophets and scriptural records. The resurrected Christ visited the Book of Mormon peoples and organized His church among them, indicating that He would then go to the Lost Tribes to do the same thing (3 Nephi 16:1-4; 17:4).